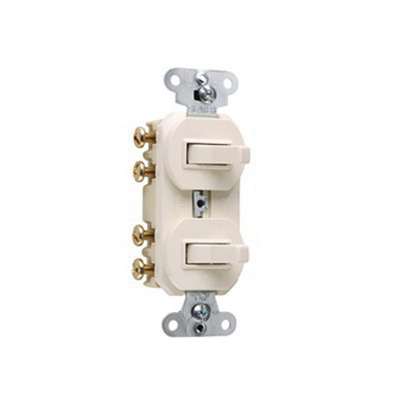 Pass & Seymour 3-Way Double combination toggle switch has voltage rating of 120/277-Volt AC and current rating of 15-Amps. Switch in light almond color, features dual mechanical shutter system that prevents insertion of foreign objects. With side wiring, this switch accommodates wire of size 14 - 12-AWG. It measures 1.32-Inch x 0.94-Inch x 3.28-Inch. Toggle switch is UL listed, RoHS compliant and meets NEMA standards.